In the early days of computing, an information record of a computer' s memory content was kept on punched cards similar to the way in which an automated piano stores the keynote sequences on a piano roll. Later, magnetic tape was used to store electronic signals, and is still the favoured means of economically backing up the contents of hard drives. However, accessing information sequentially stored on tape is slow since the electroniodata must be input through a fixed head in a single pass. 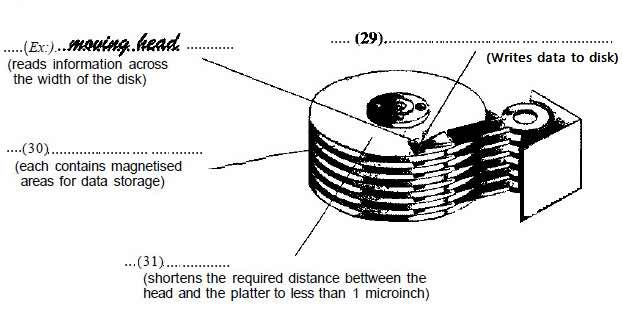 Refer to Reading Passage 118 "Hard Disk Drive Technology" and the diagram below. Refer to Reading Passage 118 "Hard Disk Drive Technology", and decide which of the answers best completes the following sentences. Write your answers in boxes 32 - 36 on your Answer Sheet. The following following text is a summary of part of Reading Passage 118.